The most common image when you think of loft insulation is one of fibreglass rolled out and laid end to end across the rafters. Running a close second is usually loose fill insulation that’s packed between joists. However, another option that is less frequently discussed is spray foam insulation. It’s almost the hidden gem of insulation options, both in the way it protects your home and the way it blends seamlessly into a loft environment without rendering the space useless. So, if you put traditional home insulation against spray foam, what are the results? With fibreglass insulation, up to 30% of air can escape through it. That’s a problem straight away, and the loss can be greater if it isn’t properly installed. Plus, if it’s difficult to obtain decent effective coverage (see below), the thermal properties may further decrease. The beauty of spray foam is that it conforms to the space and therefore its coverage is more complete. This improves the thermal properties of the insulation, but the way the foam is formed and the way it hardens offer a greater R-value per square inch. In other words, you’d need more fibreglass insulation to bring it into line and you’d still have coverage problems. Fibreglass rolls are indeed an effective insulator. The problems come, though, when you use it to cover an area as unusual as lofts are apt to be. As hard as you try, it’s never going to fit into all the corners, nooks and crannies that you find in lofts. This means that there are still gaps in your home insulation. It’s also worth noting that having electrics and other utilities up in the loft area will occasionally require people to go up there and, once the insulation is flattened, it loses its efficacy. Spray foam insulation, on the other hand, expands to fill those troublesome corners and therefore covers more of your property than traditional insulation ever could. It forms a complete barrier and means that heat can’t escape from your home by simply going around your insulation – there is no way around it. When you install traditional fibreglass insulation in a loft, that’s the space accounted for. The amount of room the insulation takes up, plus the fact that you can’t tread on it, means that the loft is effectively out of bounds. However, when you apply foam loft insulation to the interior of a loft, it’s applied directly to the surface and achieves an adequate R-value in a relatively thin layer. The remainder of your attic is yours to use as you wish. Cost is obviously a key consideration when you’re installing any insulation, and the initial outlay for fibreglass insulation is indeed smaller than for spray foam insulation. However, there are two major elements to remember when you’re thinking about cost – firstly, the fact that spray foam covers more of the surface effectively means that your energy bills will be reduced permanently. Secondly, over the life of the insulation, those savings will naturally be greater and, furthermore, the lifetime of spray foam insulation is up to 25 years – that’s a long time to reap the rewards of a smart home insulation purchase. The benefits of spray foam compared to traditional fibreglass insulation can be summed up by highlighting three points: improved energy conservation, better coverage and the freeing up of attic space. 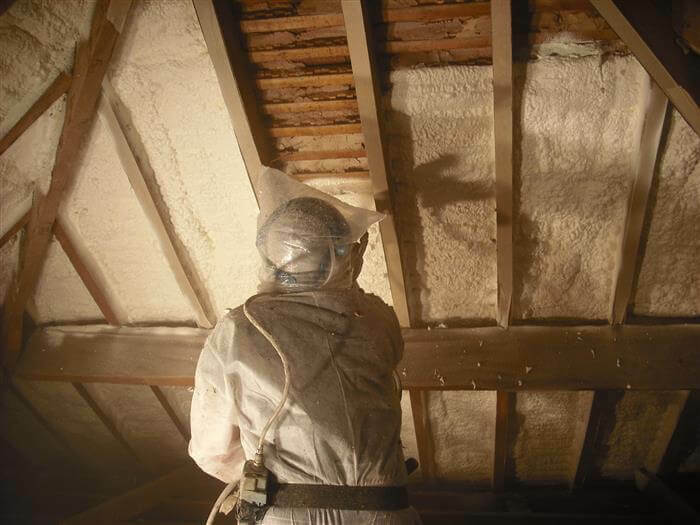 While the initial outlay may be more expensive, bear in mind that spray foam insulation pays for itself in the long term and that it will lower your energy bills more effectively than fibreglass rolls ever could.